You are here: Home / Ethnic Groups / The People of Sumatra / Who are the Aji? The Aji are a small community who live in a mountainous area of South Sumatra. They are often called the Haji people because according to a folktale they are descendants of a “Haji” (a person who has completed the Hajj). The Aji live in 14 villages. Eleven of the villages are clustered together in the Muara Dua District of southern Ogan Komering Ulu Regency (OKU). In addition, there are three Aji villages located outside of the Muara Dua District cluster. The Aji live in mixed communities with the Daya and Komering people. The Aji have a very small population, quite different from the larger neighboring people groups such as the Ogan, Daya, and Komering. According to a local folktale, the Aji language was created from twelve different languages. According to the tale, in the days of their ancestors, when it came time to distribute the languages, the ancestor of the Aji people group arrived late because he overslept. In the end he was forced to ask for a just a little bit of language from each of twelve other people groups, which combined to become the Aji language. The Aji language differs from that of other surrounding people groups such as the Ogan, Komering, Daya, and Ranau, and cannot be understood by them. However, the Aji are able to speak almost all the languages of South Sumatra. They are very proud of this fact, which they often bring up when they speak to outsiders. 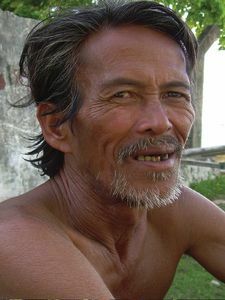 However, from a linguistic point of view, the Aji language is most closely related to Malay, with heavy borrowing from Daya. The Aji people make a living by growing two crops: coffee and rubber. Coffee as a commodity represents the primary source of income for the flatland areas of South Sumatra including the Aji homeland. However, almost all Aji young people move out of the area searching for jobs in other areas. Most of them go to Java, with Jakarta as the most frequent destination. Aji people also raise small livestock as a source of income. Most Aji families own goats or chickens as household pets. The Aji people are Muslims and a mosque can be found in every village. The Aji maintain good relationships with people of other religions and no religious disturbances have been reported in their area. However, they still practice cultic worship of objects that were passed down to them by their ancestors, including war relics. Small business management and home industry training could help reduce poverty in Aji areas and bring work opportunities to young Aji people. Today, almost all Aji young people leave the Aji area in search of work.